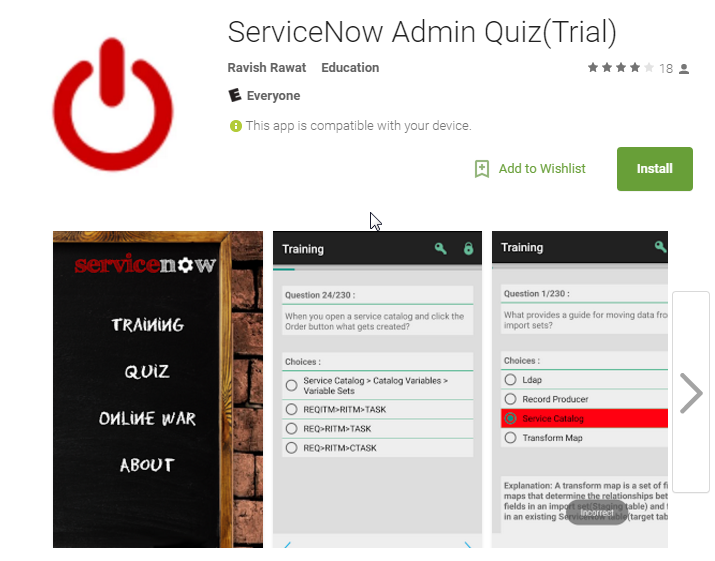 Servicenow Admin Quiz – Provides you a wide range of Admin/Interview questions with smart answers. A form displays a single record from a table. Which of the following are form feature field status indicators? What are the list interface elements? A field is a cell in a table. Each field holds an individual piece of data. What field type in a list is not sortable? What is a Power edge toolbar? It’s the gray toolbar on the left side of the screen for the new ui. iii. Create and manage bookmarks. What features of ITIL are utilized by the ServiceNow platform? a. Service Now is a cloud based ITSM tool built on Web 2.0, SAAS , ITIL v3, PaaS, and IT 3.0. Its significant differential from competitors is that ServiceNow applications are built on a single platform. i. SAAS – Software as a service- Service now is the on-demand leader in IT service management. iii. Platform as a Service (PAAS) – delivery of an ondemand, webased solution stack. Servicenow is java based and uses tomcat on liniux. Which of the following are contained in the banner frame that runs across the top of every Servicenow webpage? An application is a group of modules? True – Applications are a grouping of modules or an organizational element in service now. True or false – The application navigator provides links to all applications and modules they comprise. In what way does the Switch perspective feature in application navigator assist you in organizing applications in Servicenow? It allows you to view applictions from the perspective of individual roles such as ITIL, Asset Management, or Admin ect. What is the main area in all Servicenow web pages? A horizontal display of filter conditions showing the hierarchy of the conditions used to display the form or list results. Where is the impersonation feature located? What are the 3 ways to bring users into the ServiceNow system? What are the benefits of using groups? a. A role is an orginazational element. Roles are granted access to applications. c. A role is a record in the Role table; a role is a persona that is assigned to a group or single user. An example is the admin role. What are the OOTB Servicenow roles? a. ACLs are a list of all access controls for a table. Access controls are defined by roles, conditional expressions and scripts. b. ACL rules are used to control what data users can access and how they can access it. v. Move admin to selected column. What is the the high security plugin in ServiceNow? What is contextual security in ServiceNow? An elevated permission is a role that has special permissions for the duration of the log in session. The CMDB application in Service now does all of the following. What are the two major record types in the ucmdb? What is a business service map (bsm)? a. business service map graphically displays the configuration items that compose a business service and indicates the status of those configuration items. b. **A good example of a business service map is exchange and all the upstream and down stream CIS that make up the exchange service. Multiple Choice, Single Line Text, and Select Box are what type of elements in Servicenow? c. An example of a metric is that it could measure the effectiveness of the incident resolution process by calculating how long it takes to resolve an incident. What are the types of metrics? a. Field value duration – measures a time interval from when a value in a field is achieved until it is changed. What does Custom Charting plugin allow you to do? What does a Servicenow homepage provide? a. Is a record in the SLA[contract_sla] table which defines a set amount of time for a task to reach a certain condition, the tables to access and what type of sla is being evaluated. What is the greatest benefit of utilizing SLAS? a. SLA’s allow an IT Service Desk to track if there representatives are providing a specific level of service, and run reports on the success rates of the SLA actions. b. Slas are commonly used to make sure incidents are being resolved within desired amount of time. In SLA definition, what are the conditions that will trigger an SLA? What are the 4 aspects of Service Level Agreement? What are the types of SLAS in Servicenow? 1. It’s a tool for supplier management. What is a Servicenow knowledge base? How is the knowledge base populated? What is the hierarchy of the knowledge base? c. Increase size of mailbox. What is the Service Catalog in Servicenow? What is a Record producer and how does it relate to the Service Catalog? ii. They provide a single point of entry to create an incident or request. i. Depending on what fields are chosen on the form, the system displays relevant catalog items. True or False- an order generates a request? What are the 3 types of numbers from orders? What do Service Catalog Variables provide? (Variables are like questions in Kinetic Request). True or False – The order field establishes the sequence for displaying the variables? True or False – A variable Set is a modular unit of variables that can be shared between catalog items? What role allows users to define catalog items? What is an update set? a. A group of customizations that can be moved from one instance to another. b. Allows administrators to group a series of changes into a named set and then move this set as a unit to the other instance. c. Update sets are “point in time” xml snapshots of records. True or False, an update set is a “point in time” XML snapshot of the record? Which of the following are you allowed to make customizations to? b. Changes made to a form – B this is the answer. True or False – it is best practice to never make changes to an update set in the Default update set? True – The baseline and Default update sets are self-maintaining and it is not recommended to change or delete or move them between systems. Which of the following are best practices when working with update sets? True or false – Do not delete update sets? What is an import set? b. An import set is a tool used to import data from various data sources and then map that data into servicenow tables. 2) Data that already matches or exists is skipped. What is the purpose of the import set table? What are the possible import sources? What do transformation maps do? a. Kinda like Extract, Transform, load except its Import transform load. c. Allow you to transform import data into Servicenow format you desire. e. Any field within a table can serve as a potential destination for transformation from a field within an import set. What is the task table? Task [task] is one of the core tables provided with the base system. It provides a series of standard fields used on each of the tables that extend it, such as the Incident [incident] and Problem [problem] tables. In addition, any table which extends task can take advantage of task-specific functionality for driving tasks. a. Ui policy is client side business rules (like active links in Remedy). UI Actions are an easy way to put buttons, links, and context menu items on forms and lists, making the UI more interactive, customizable, and specific to user activities. These buttons, links, and context menu items can be scripted, making them more powerful. ii. Workflows provide a summary of workflow progress by updating any field designated as a stage field. What are 3 ways to attach workflows to particular requests? Once the Service Catalog Request is submitted, what workflow stages does the request go to? The Graphical Workflow Editor is used to drive delivery of a service catalog order; what are the three basic components to generate and assign? Which of the following are workflow activities? True or False – Workflows need to be checked out before they can be edited? True or False – To make a new or edited workflow available to all users, it needs to be published. What are common, OOTB places where workflows are commonly seen in Servicenow? True or False – All Workflows have a beginning and end?